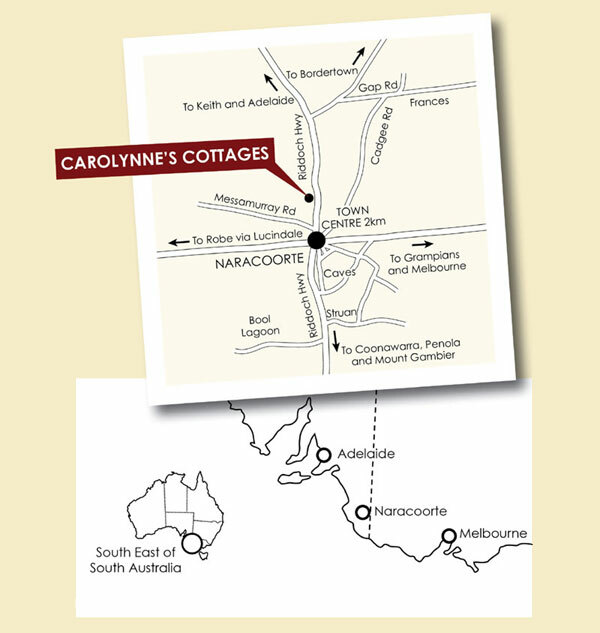 From Adelaide follow the Riddoch Highway until you reach the outskirts of Naracoorte then just on the 100 km sign take a right turn onto a service road called Young Drive and follow through until the crest of the rise to the stone gateway of Carolynne's Cottages. From Melbourne via Horsham drive through the town following the main street through to the second roundabout and take the road to the right indicating to Adelaide. Follow this road for about 2.5 kilometres past the Naracoorte High School, William McIntosh Motel and then just after the Greenline Motel take a left turn onto a service road called Young Drive and follow through until the crest of the rise to the stone gateway of Carolynne's Cottages. From Mount Gambier continue into the Settlers Cafe on your right on the Penola Road then take a left turn down Deviation Road and then continue around the roundabout on the road indicating to Adelaide. Follow this road for about 2.5 kilometres past the Naracoorte High School, William McIntosh Motel and then just after the Greenline Motel take a left turn onto a service road called Young Drive and follow through until the crest of the rise to the stone gateway of Carolynne's Cottages.